Remember the haul I did last month? Well, I just got around to swatching the two Nina Ultra Pro polishes that I purchased. I found these at Sally's on Clearance for about $2.99 I believe. Shooting Star is a textured polish with small round glitter. This was two coats and no top coat. I was extremely surprised when I applied these to my nails. Little did I know they were TEXTURED! Whhhaattt?! I'm so stoked to have a silver textured polish. It's insanely sparkly and I was really surprised how long this lasted on my nails. It lasted about 4 days before I got bored and took it off. 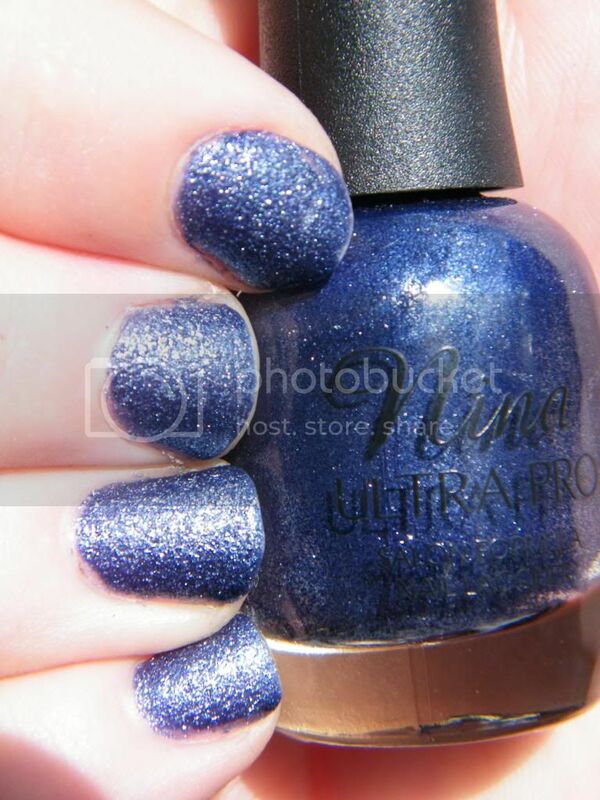 Twinkle Twinkle is a textured dark blue polish with green and purple micro glitter. I know you can purchase these two polishes at Sally Beauty Supply. They are sold out online, but it would be better to find them IN store if you can because it would be cheaper. I'm sorry for the lack of really anything in this post and the horrid pictures of the polishes. Normally I wouldn't even put these pictures out there but I needed to get a post up before I started to feel like I was neglecting everyone. If you've seen my twitter of instagram, we had to put our dog Rosie down, so it's been a difficult couple days for myself and everyone here. But enough sadness, I promise my next blog post wont be so crap.